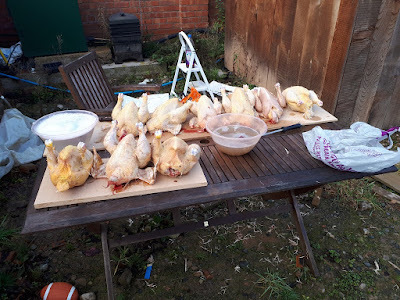 I got myself more organised on Sunday and butchered 9 more chickens. 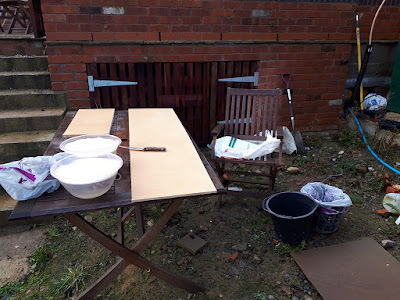 I set up a patio table with chopping boards on that could be scrubbed down (this is waste sheet material that can be thrown away afterwards). I sharpened my knife, had a steel to sharpen it as I went and two bowls of hot soapy water to keep everything clean. I also had two buckets, one for feathers (that can be composted) and one for feet and guts. 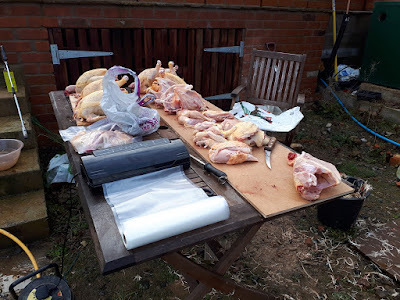 I also had some plastic feed sacks on hand, one to sit on (it had rained in the night) and one to have on my lap to stop the wet birds from soaking my trousers. A large saucepan of water was also warming on the BBQ. The birds for slaughter were pulled out before they'd been fed and kept in a crate away from the others until their time came. I started with batched but found it was far better to do one at a time, slaughter, drain, dip in hot water, pluck. None of them went very quickly but I learnt that having the water the right temperature makes a huge difference. Unfortunately my thermometer doesn't seem to work so I just had to guess. 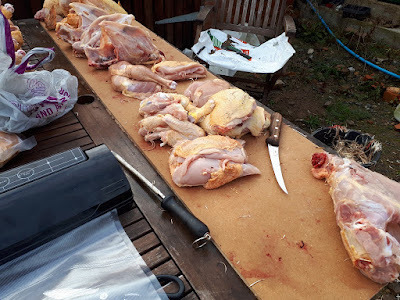 One bird was dipped too hot so I ended up skinning that one as the skin ripped too easily. 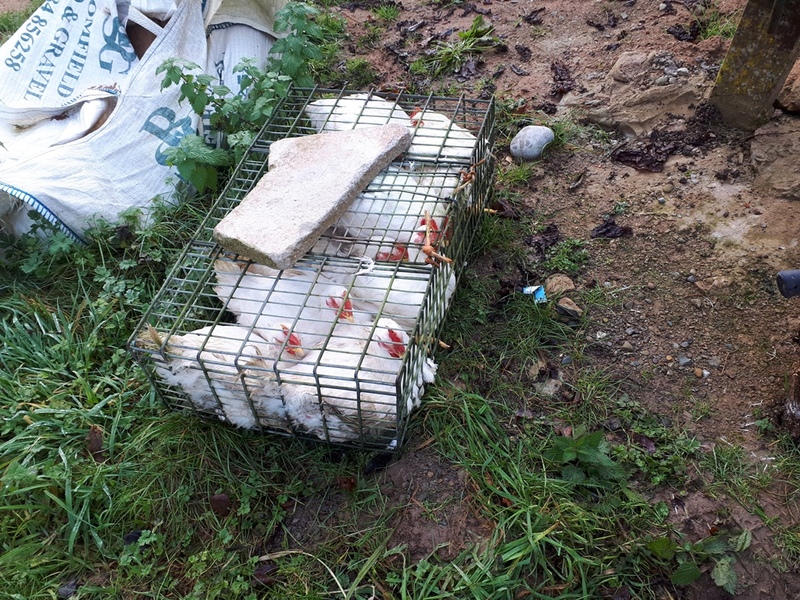 Once I had all the birds plucked I then wiped down and set up for gutting, never a nice job but it went quite quickly. I separated the birds up into ones that looked good as whole birds and ones that were better jointed. I kept five birds whole and cut the others into breasts, whole legs and wings. I then used my new vacuum packer to bag the birds up and separate the jointed ones into meal sized portions. Three legs or breasts seemed about right for our family. 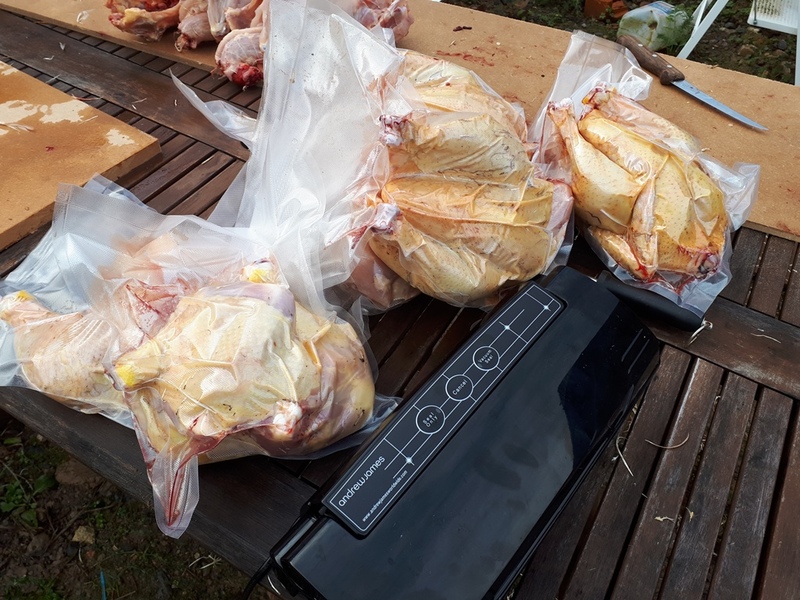 I bagged and froze the stripped carcasses as well so I can make a big batch of stock when I get chance. I'd like a chicken plucker, it's not great doing them by hand. I need a bigger saucepan or something to hot dip the birds into, mine is only just big enough and soon needs topping up with more hot water. The bench I butchered them on was too low, my back was hurting as I was bending the whole time, I proper work bench would be ideal. An outside sink would help an amazing amount, something I might have to consider installing! So some hard work, but the freezer has certainly been stocked up! I've still got six birds left and I'll leave these a while longer to see how big they get, it would be great to have some big ones to save having to buy a turkey for Christmas. What do you think? Is there anything you'd do differently to how I set it up this time? Very similar to what I do except I usually only process three or four birds at a time. Dipping in hot water (I use a large plastic bucket) helps a lot with plucking but it is still a tedious part of the process. Once I've plucked it my wife does the final bit of plucking to get a clean finish whilst I go on to the next bird. After gutting I soak in clean salty water then drain before bagging and freezing. Just another point. I don't hang chickens but I do hang turkeys after plucking, for seven days, before eviseration. This means the hot water method can't be used so after bleeding I start plucking straight away whilst the turkey is still warm. Strangely enough I find turkeys pluck easier than chickens. Dipping in salty water sounds a good tip. My uncle had an old tea urn for dipping into before plucking, seemed to work great. The feet! Don't throw away the feet. They make the very best broth and stock. Dipping them in hot water peels the outer skin off like socks. Put them in the stockpot with the rest of the carcass and you'll love the outcome. Martin got himself a proper butchers block table its the right height and can be scrubbed down after use, we do just a couple at a time, he also prefers to bleed them rather than break the neck he finds they go quickly and easily. We are looking at getting a plucker next year as we want to increase the amount of poultry we do.